However, you can find situations where birds somewhat stationary or mildly predictable. One of those is a feeding station. Another is a rookery, a large colony of birds nesting together. Rookeries can be found all over from an island in the middle of lake in a city to the middle of zoos. 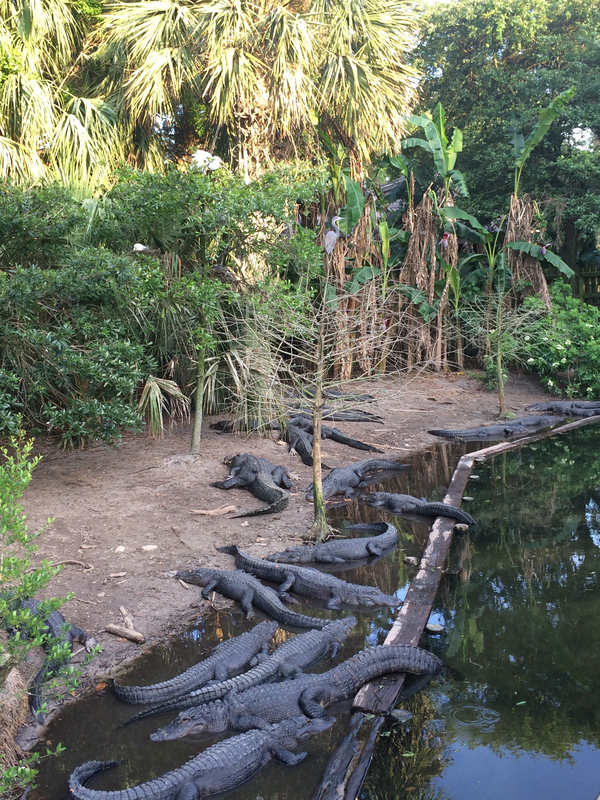 Some of the most fun rookeries can be found in Florida at the various alligator farms. Herons and egrets have figured out that a great way to avoid raccoons crawling up their trees to eat their eggs and chicks is to nest over hundreds of alligators and crocodiles. Of course, there is a price to pay, if a chick falls out of the nest before it can fly, they will become a gator snack but for the most part, the birds flourish in these reptile zoos. I visited one called St. Augustine Alligator Farm and Zoological Park in Florida. 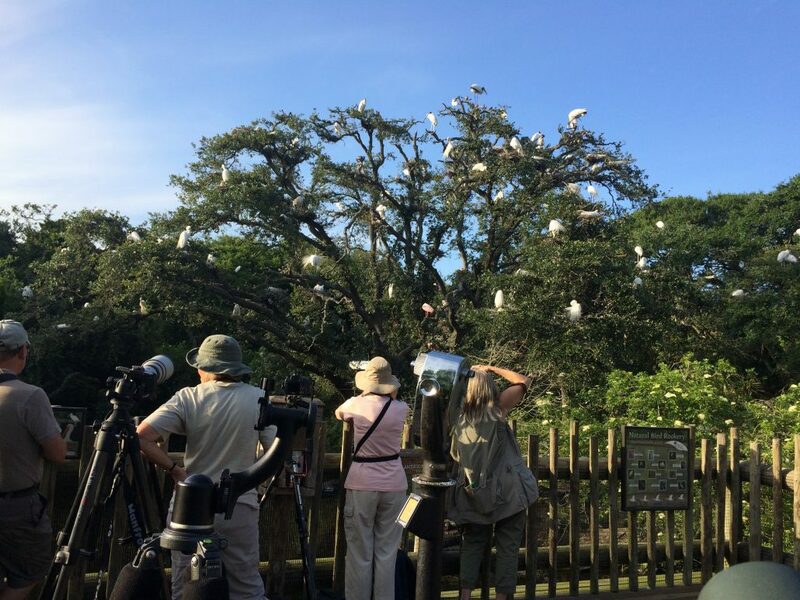 This place is aware of what a hot ticket their wading bird rookery is with photographers. So they offer an annual membership with special pricing and hours just for people to take pictures when the rookery is the most active. For $89.95 you get a year round membership and access to the park and hour before they open and an hour after close. And before you ask, no there is no discount for someone who is only going to be there for a few days on vacation. They know what a hot ticket it is and if photography is your bag, it’s worth it even for only two visits. The photography pass is a win/win for everyone involved. Photographers and tripods won’t be competing with families who want to walk the boardwalk for alligators and those extra hours also happen to coincide with that magic hour light just after sunrise and just before sunset. The photo passes allow you to be out with fellow photographers to get the shots of birds nesting. Photo by The Birdchick. Most of the photographers that were around me had a traditional set up and I noticed had to be closer to the birds than I did. 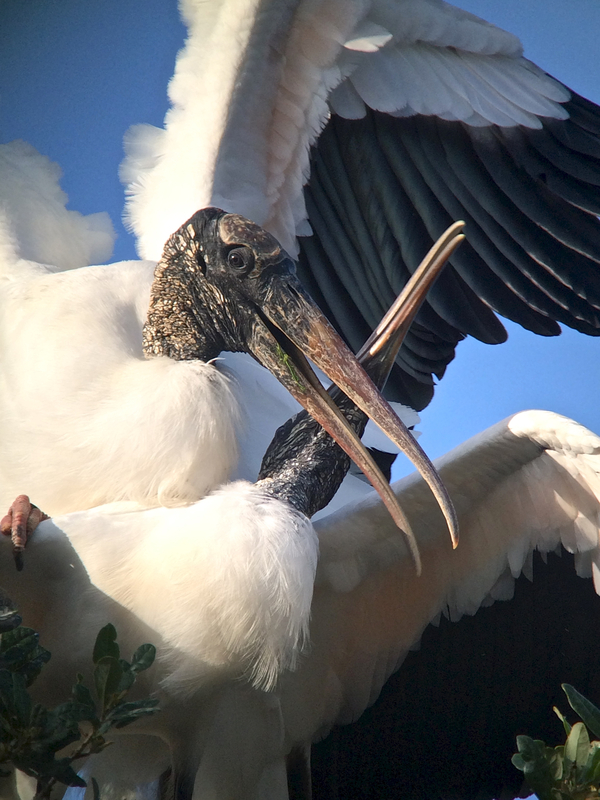 However, with my Swarovski ATX 85mm spotting scope, iPhone 5s and Phone Skope digiscoping adapter, I was able to hang back and get some spectacular photos of Florida birds. If you arrive in the morning, you get there just before there’s any light. As you find a place in the dark with other photographers you can hear and smell that there are a lot of fishing eating birds around. And as it gets lighter you can get photos. The perks of using a smart phone with a scope and a Phone Skope adapter is that the phone is very forgiving in low light and you can get some fun silhouette shots. 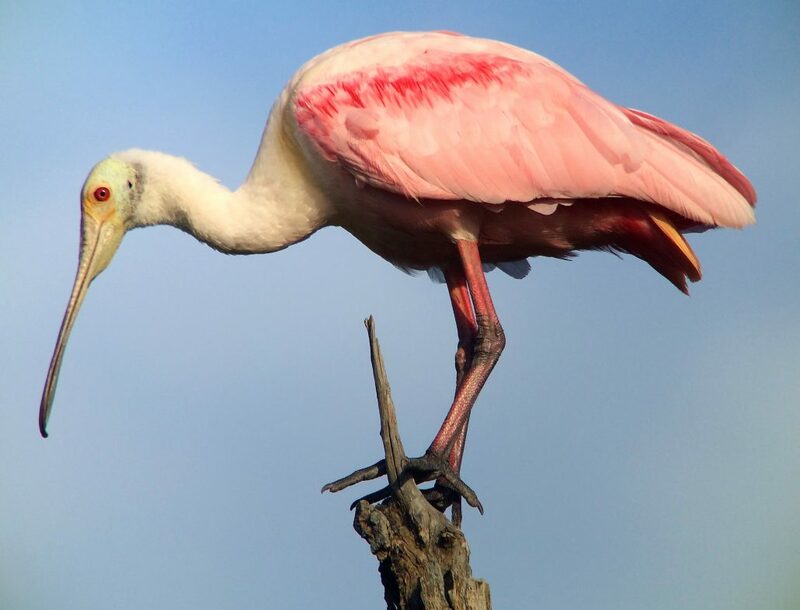 As the light reaches perfection, you will soon have field worthy photos of Roseate Spoonbills, Wood Storks, Snowy Egrets ad Tri-colored Herons just to name a few of the species. In fact, you biggest challenge may be that some of the birds are far too close to the boardwalk to digiscope. It won't take you long to get field guide worthy shots of wading birds when visiting an alligator farm rookery. Photo by The Birdchick. However, after you have easily gotten your perfect full body shot of a Great Egret feeding its chicks, try to get arty with your photos. There are oodles of full body shots of herons and egrets out there, try to get a view of these birds that someone else hasn’t captured. These are gorgeous and elegantly shaped creatures. Try to find a way to capture the way their feathers flow around those crazy long beaks. Play around with getting both vertical and horizontal shots. 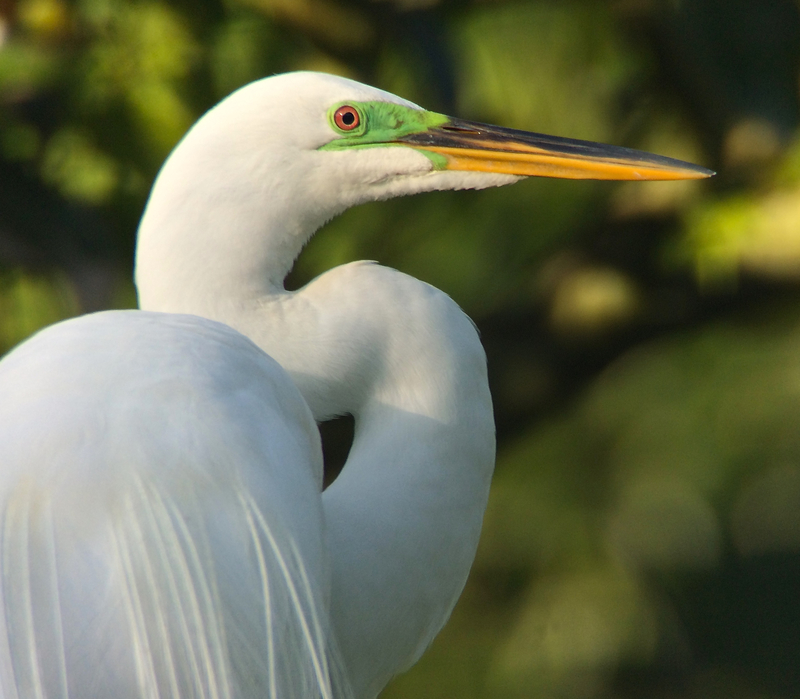 Note how the Great Egret's skin turns green during breeding seasons. Photo by The Birdchick. You’ll also start to notice some interesting changes in these birds during breeding season as you take their pictures. For one thing, the area of skin between the eye and the beak of the Great Egret turns a vivid lime green during breeding season. 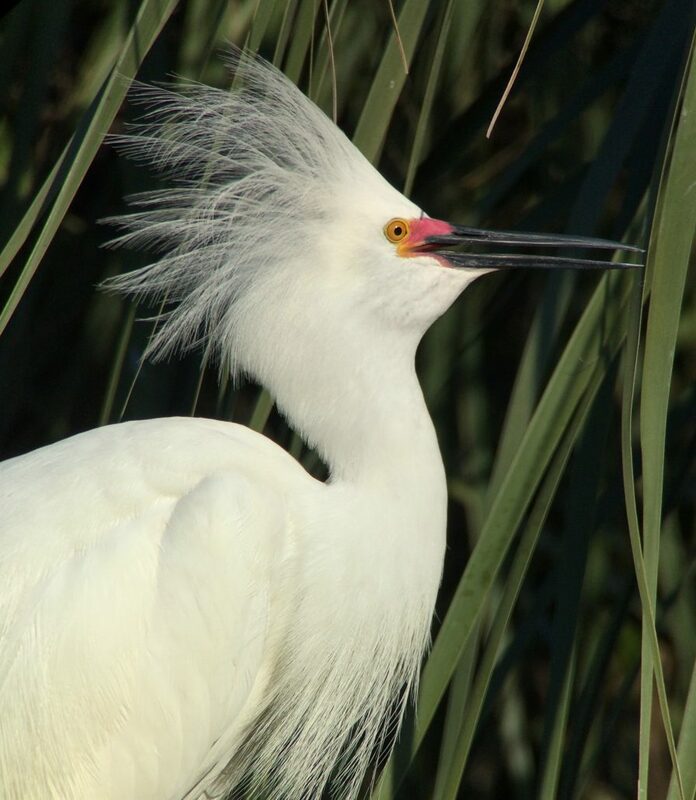 If you happen to catch a Snowy Egret before it displays, the skin between the beak and the eyes is yellow, but once the display happens it turns bright red. Note the wild and crazed look and red patch of skin when a Snowy Egret displays. Photo by The Birdchick. You can even play with video a bit, but the challenge is that you’ll be on a wooden board walk so when someone walks by, that will cause some vibration to the image. Also, sometimes the alligators start growling and that will also cause your image to shake. The rookery is active at only certain times of year. You can check the St Augustine Alligator Farm’s website for the best times to visit (https://www.alligatorfarm.com/). There are other gator farms with rookeries too so if you and your family have a vacation planned near one, find out if and when wading birds might be nesting inside the gates.